Old Orchard Beach, ME – Donna F. (Merrill) Roy, 71, of Old Orchard Beach died Saturday, December 3, 2016 at the Gosnell Memorial Hospice House in Scarborough. She was the wife of the late Donald Roy, former Old Orchard Beach Fire Chief, who died on February 3, 1990. She was born in Rochester, NH on September 25, 1945 a daughter of the late Lawrence E. & Ethelyn P. (Hoyt) Merrill. 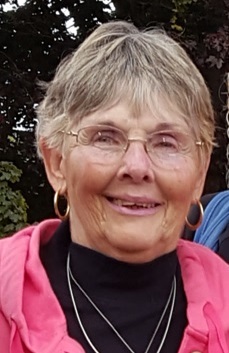 Donna spent many years at Fairchild Semiconductor as a line supervisor and also spent several years on the Board of Directors for the Old Orchard Beach United Methodist Church. Donna was a devoted Mother and Grandmother and loved her dog Niko. She was an avid gardener, loving her Black-Eyed Susan’s and could tell you just about anything you wanted to know about the QVC host. She treasured her home, having spent over 50 years there. She is survived by her daughters Kim McLaughlin and her fiancé George Greene of Old Orchard Beach and Kelly Roy of Fountain, CO. She also leaves her grandchildren Megan McLaughlin and her partner Michael Fitzgerald, Kristie McLaughlin and her fiancé, Brian McLaughlin, Kaitlyn Budicky and Gage Roy; as well as her brother Richard “Fuzzy” Merrill and his wife Claudette of Old Orchard Beach. Per Donna’s request, there will be no services. In lieu of flowers, and given her devotion to her dog, Niko, please make dog food donations to the Old Orchard Beach Community Animal Watch, 1 Portland Ave (Town Hall) or to the Animal Welfare Society of Kennebunk.